Find helpful dental information in our digital library. Losing teeth to tooth decay or periodontal (gum) disease is never easy. But with implant-supported bridgework, you can regain lost function and appearance with a restoration that could last for many years. Don’t think, though, that dental disease woes are a thing of the past with your new implants. Although your restoration itself can’t be infected, the supporting gums and underlying bone can, often through bacterial plaque accumulating around the implants. The bone that supports the implants could deteriorate, dramatically increasing your chances of losing your restoration. It’s essential, then, that you keep the area between the bridge and gums clean of plaque through daily hygiene. This definitely includes flossing around the implants. Flossing with an implant-supported bridge will be different than with natural teeth: instead of flossing between teeth you’ll need to thread the floss between the bridge and gums. Although this is a bit more difficult, it can be done with the help of a floss threader, a device with a loop on one end and a long, thin plastic point on the other—similar to a sewing needle. 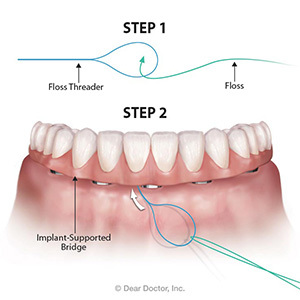 To use it, thread about 18” of floss through the loop and then pass the threader’s thin end first through the space between the bridge and gums toward the tongue until the floss threader pulls through. You can then take hold of one end of the floss and then pull the threader completely out from beneath the bridge. Then, you wrap the ends around your fingers as you would normally and thoroughly floss the implant surfaces you’re accessing. You then release one end of the floss, pull out the remainder, rethread it in the threader and repeat the process in the next space between implants. You also have other hygiene tool options: prefabricated floss with stiffened ends that thread through the bridge-gum space that you can use very easily; or you can purchase an interproximal brush that resembles a pipe cleaner with thin plastic bristles to access the space and brush around the implants. Some patients also find an oral irrigator, a handheld device that sprays a pressurized stream of water to loosen and flush away plaque, to be an effective way of keeping this important area clean. But that said, oral irrigators generally aren’t as effective removing dental plaque as are floss or interproximal brushes. Whatever flossing method you choose, the important thing is to choose one and practice it every day. By keeping bacterial plaque from building up around your implants, you’ll help ensure you won’t lose your restoration to disease, so it can continue to serve you for many years to come. If you would like more information on caring for your dental work, please contact us or schedule an appointment for a consultation.